Designed for use with VESA compatible monitors, TVs, interactive tablets & more (sold separately)! Rotating bracket can easily be rotated from horizontal to vertical orientation! 180° Tilt for displaying devices at ideal viewing angle! 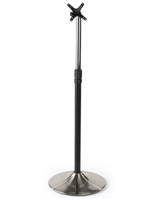 Glossy black, fixed height stand measures 40-1/4"h for presenting content at eye level! The use of touchscreen devices on a portable stand for tablet within a business is quickly increasing in popularity. Retailers, hotels and food service locations are placing these multimedia solutions within their business locations, to not only attract patrons, but to help them make more educated purchases, as well as to provide a more tech-savvy image. How can this stand for tablet PC benefit these types of businesses? These particular digital signage accessories include a bracket with a series of mounting holes, for use with various TVs and monitors that are VESA compatible. This stand for tablet, that includes a VESA bracket, is designed for use with devices that have 75mm x 75mm and 100mm x 100mm mounting holes. 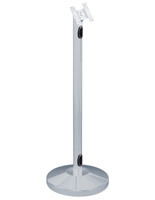 Android devices (sold separately) are designed to mount to these floorstanding fixtures, as they feature these hole patterns on the back side. What features differentiate this portable stand for tablet, that is designed for business use, from other models? 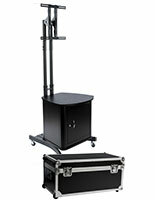 Each unit comes with a versatile mount that can be both angled and tilted. 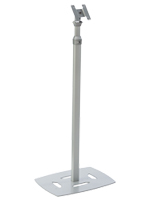 A stand for tablet with rotating mount, such as the one seen here, can be positioned at the optimal viewing angle. Store clerks and employees can position the touchscreen device at eye level, for patrons to view the on-screen information. Each stand for tablet, that can be tilted, can also be rotated, without having to remove the player from the floorstanding fixture. This enables store clerks to easily rotate the device from portrait to landscape orientation! 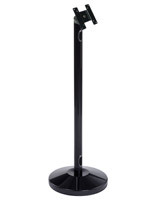 Another key feature of this stand for tablet is the glossy black finish. 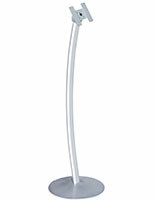 The curved design of the upright is both attractive and functional. This is also a portable stand for tablet. The digital signage accessories are light weight, enabling employees to store the fixtures in a back room at the close of each business day. This will help prevent theft. 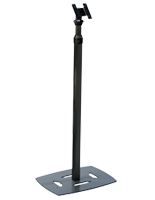 Trade show exhibitors also use this fixture during their events, which makes portability an important factor to consider when purchasing this type of device. A light weight makes bringing this portable unit to events even easier. Please Note: These digital signage accessories do not include a touchscreen device or an Apple® iPad. However, commercial interactive players can be purchased separately on this website.